Before you start spinning numbers and planning activities, you need to realize that employee engagement is a mindset. The only way that an engagement strategy will yield results is if you start with the “why” of the matter, with each activity and event you plan. As a manager, keeping your employees engaged is perhaps the biggest challenge you face. It’s also a huge opportunity to gain long-term commitment and discretionary effort from your team. That effort will ultimately lead to higher sales and fewer mistakes. There is more and more convincing evidence that improving employee engagement can significantly improve company performance across a number of key areas, such as; profitability, productivity, customer satisfaction, innovation, health and safety, sickness and absence, turnover and wellbeing. But, in order to achieve that, your engagement efforts have to be aligned with your overall business strategy. Implementing unplanned ideas and activities that you think might help, without monitoring or measuring their impact, is a waste of time and resources. You have to be clear about “what” you want to achieve in your company, before jumping to “how” you’re going to go about it. Your HR function is essential in defining and planning an employee engagement strategy that aligns with your organization’s goals. Like we pointed out in a recent article, HR has a much more strategic function within a company and should be involved in the business planning process to ensure its profitability. Being inherently cross-functional, the HR function has a high degree of authority in terms of managing the employees who will ultimately execute that strategy. Employee engagement is not an isolated HR process. In order for it to deliver the benefits we talked about earlier, it needs organizational commitment and involvement to implement efficient initiatives. 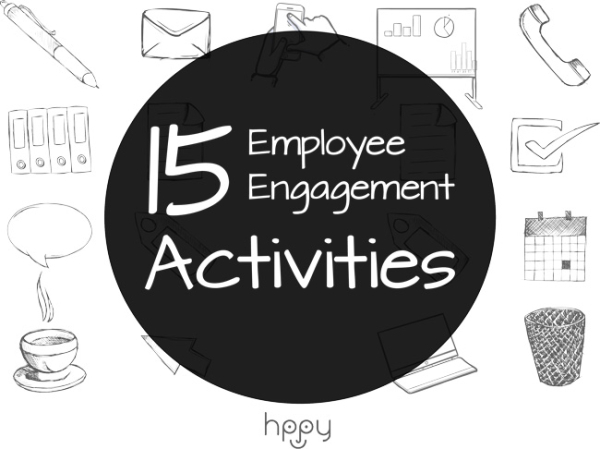 Now that we have that covered, whether you’re simply browsing for some ideas that might boost up morale or if you’re putting down the final details for your HR strategy, here are 15 activities ideas that you should try! 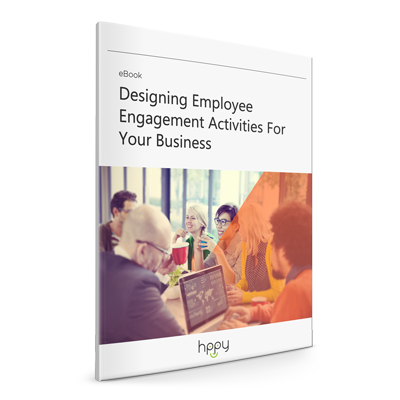 If you’re short on time or if you prefer to have it all in a pdf, download the free eBook and go over it when you have more time to design and implement these employee engagement activities. Every 6 months, or even quarterly, present the most important issues in your company and the actions made to address those issues. Involve your team in planning ahead, assessing opportunities and coming up with improvement ideas for your business strategy. By promoting transparency and offering them a strategic insight into how the company is being managed, you’ll foster loyalty and you’ll also have a prepared leadership pipeline. One of the biggest costs of a high employee turnover rate is the loss of essential information. A knowledge sharing system helps you avoid that cost, to some extent, and it’s also a great engagement driver for newcomers. You can have a mentorship program, pairing experienced employees with newly hired ones or use communication software. Create a learning program template that they should follow, giving them enough space to test their own learning methods. Give them a timeframe, a set of objectives and let the relationship unfold on its own. Teams are oftentimes isolated within their own project and their own workspace, that they have no idea what the rest of the company is doing. Create an open sharing space, once every 2 months or so, where every team can present updates on their project and key learning points. Teams will evolve much more rapidly, using the knowledge shared and the different experiences on every project. To minimize the risk of this turning into a boring, mandatory 2h meeting, make it fun and creative. You can have a theme per each sharing session. For example, this month’s theme is “Mafia movies” and the Sales team decides to present its updates in a Godfather-like manner. Remember, creativity is a key happiness driver. You should also try the Happiness at Work Card Game for teams! Designed as a tool for team performance and employee engagement, the game consists of over 50 common workplace scenarios and over 100 science-based solutions. Each scenario identifies and provides context for a common workplace situation, followed by a succinct scientific justification for why it is a problem at work. Each solution falls within one of four categories: Practice Positivity, Subdue Stress, Flow to Goals, and Revitalize Relationships. The cards provide many unique practice opportunities that meet the needs and working styles of diverse teams. Nothing builds trust like showing someone your financial statement. And that’s exactly what you should do in your company. Give your team a quick presentation of the financial state of your company, every quarter or at the end of the year. Show them how everyone’s efforts are linked together, set bold objectives for the next months and get everyone involved in meeting those objectives. You’ll notice that this activity links back to the 1st one. Encourage employees to take responsibility for the success of the company if you want them to put in their discretionary effort. Create your own Academy, where employees can access the knowledge and development opportunities that they need. This is one of the top 3 reasons why employees quit companies: lack of learning prospects. Assess their needs and their preferences, create a curriculum and set-up 1-2 classes per week. Get them involved in deciding how you should schedule these learning initiatives (during or after working hours). Make it engaging and rewarding with a Graduation ceremony, caps and flowers and even a fun night out. Have your own Office Olympics where everyone can get involved and have fun. Promote wellbeing and the benefits of a healthy lifestyle in a fun, competitive way. Get to know each other in a different environment and connect people with the same interests. It’s a great chance to get some of those chair-numbed-muscles going and bond in a friendly competition. Prizes and embarrassing photos are a must. Break monotony with an ambitious working night. Set a clear objective, create your own set of rules (breaks, music, snacks, etc.) and try to be as productive as possible in just one night. Get everyone together and test your creative and operational limits. I promise it’s going to be really fun! Here’s how the team at HubSpot got together to create 200 hours’ worth of marketing content in one hack night. Make sure you communicate upcoming opportunities on a regular basis. Get employees excited and striving for what’s next. Do it in your internal newsletter, face-to-face or during a general update meeting. If they’re excited about what’s next, they’ll do their best and reply with a “No, thank you” to those irritating poaching emails from your competition. Keep in mind that a career processes should be driven by individual potential as well as current opportunities. Create a self-guided onboarding experience. People are much more likely to remember and assimilate information that they get on their own. Set the ground rules, give them basic instructions, a list of objectives and a timeframe. For example a 60 days plan, with some basic milestones. Let them swim on their own. Oftentimes, onboarding processes fail to provide actual value and initiate a dialogue. Let new employees create their own onboarding experience and figure out their work preferences. Have a scavenger hunt onboarding. Turn information that is usually considered boring or useless into company trivia and learning how to use tools and systems, such as the internal communication system. Include other people in the game. For example, have some of the older employees provide answers and get to know the new hires. Create your internal employee-focused magazine with fun columns, news, featured stories and opportunities. Who wouldn’t like to be featured on the cover as Employee of the Month? It can be an online magazine or a printed one. Or, it can be both, a monthly online issue and a quarterly printed one. Have your own company TEDx-like Talks where you get to share ideas, boost creativity and encourage innovation. Make your workplace less about work and more about the people there. Their ideas, experiences and aspirations. Give them a chance to be the source of their own inspiration, boosting morale and creativity for everyone in the company. You can make it an event of its own or include it in another event that you’re already planning. Managers are a key business component and an equally important engagement driver. Create a coaching program for managers and teach them to really care. Coach them towards maximum contribution and satisfaction, align them with the organization’s strategy, mission and values and show them how to recognize attitude, effort and results. Encourage individuals to design and own their career paths, instead of relying on the company or on their manager. Employees need to take initiative and set a career goal for themselves. Have people write their goal on a piece of paper. Put it in an envelope and close it. Then, after 6 months or a year, give them the sealed envelopes back to see if they’ve realized that goal. For this activity, managers have a guiding role. They can understand and help align employees’ aspirations with the organization’s career development point of view. Get involved in social and charity initiatives. Giving back creates a positive mentality. It also fosters pride and loyalty. Get the team together, have everyone pitch a cause and pick the one you want to support. It’s important that you make it personal, that you make it count. You can donate either time and involvement, or money, or both. Usually, giving time is more rewarding than giving money, especially for gen Y employees, who are highly oriented towards social involvement. Moving from theory to practice is a big challenge. Most companies that measure employee engagement do little beyond that measurement. “An emerging view is that engagement needs to be characterized as transformational. Organizations dedicate 90 percent of their engagement effort on ‘post survey’ activity to inspire people to do great work and match their efforts with business needs. Taking action means ensuring that all employees understand the company vision and its strategic direction, as well as what their individual role is in achieving it. It also means engaging managers by developing their leadership skills, living the company values on a day-to-day basis and allowing open, two-way communication with employees. Employee engagement is an organizational effort that requires a long-term vision in a business strategy context, if it is to improve productivity and retention rates. You have to identify what your company needs and develop the right strategy. Only then should you focus on how to measure employee engagement and what activities to implement. Thank you. Appreciate your feedback and support and i read this all topic. this is so interesting. thanks for sharing us. I really like the article. It’s simple and applicable. Thanks! Happy to hear you found it useful! Excellent article..loking forward to see more..
Nicely expressed in 15 points…simple and applicable. Thanks! Nice article ! I really appreciate you for these 15 wonderful tips. Thank you very much Paula.I got what I was searching for ! Good Points.. Simple and easy to implement. Hi, Paula thank you for these tips. These would be good at initial level. Please can you put up some ideas around talent management and succession planning which would matter employee engagement. I need to arrange activities on some activity on Independence Day. Would like to arrange some activity for family, children and the employee. Like what would you like to be free from, or independence for yourself means ?? How about a barbecue with your employees and their families? Nice and resourceful article, this one. I have to say I was pretty impressed by the 6-th tip, because that’s a thing a few people think about. If we’re talking about a team sport, that will show the employees the benefit of working together and that competing with others is important. Also, physical activities like that maintain a nice bloodstream through your body. May I mention an extra tip? Employee platforms. They are powerful and that way employees get access to all kind of information. For instance, employees from the public health system in Dallas can access their data through the Parkland webmail, which is not only an email service, but also helps them find useful insights on the company activity and/or send each other work-related emails. This article was amazing, the different approaches and ideas were well put together and simple to understand. Appreciate your findings and thoughts I hope there is more to come by in the future. Thanks Stefan! Glad you liked it! Great! To be a new HR Manager, this is very supportive and give me strength on my new role.